Genesis Disney's Toy Story (USA) in 20:24.51 by Jimmie1717 & EZGames69. 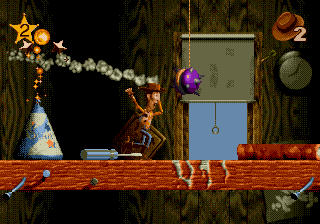 Based on the 1995 Disney Pixar movie of the same name, this game tells the story of a toy cowboy named 'Woody' and his jealousy over his owner's new toy, a 'Buzz Lightyear' figurine. Like its movie counterpart, this game features revolutionary graphics for its era and (for the most part) a unique musical score. The game also has a few different modes of play: most stages work like standard platformers, though there are racing stages and even a maze-exploration stage. Jimmie1717 & EZGames69 improve the previous TAS by 4.38 seconds. If you would like to see the TAS for the SNES version, click here.